A big relief, satisfation and pride is Disney feeling after the high expectations, long time of hard and tecnological work on Pandora: The Land of Avatar one of the main attractions of Disney Animal Kingdom Expansion. About 9 years ago it was the announcement to what finally today tourists and local will enjoy with ansiety for a good period of time. For those who watched the film really will understand the magnitude of a project like the one developed for Disney Animal Kingdom. The Pandora: Land of Avatar at Disney Animal Kingdom have 2 main attractions, the first one is Avatar Flight of Passage that will make visitors feel like they’re flying on Banshee creatures with are a characteristic element of the movie. The fly will take over a river and stunning bioluminescent forest, that will transform the look of Disney Animal Kingdom at night” the second attraction is a trip on boat on Na’vi River Journey to know the natural fauna and flora of Pandora that will include sound and animations through animatronics. Orlando Discount Tickets USA keep you inform about the main Orlando Theme Parks attractions and offer vacation packages and discounted tickets for the Theme Parks in Orlando. Our offers start from $39 dollars for one day admission to Disney Animal kingdom up to 4 days admissiomn to the Disney Theme Parks with the hopper admission for free, paying onlu $239 dollars per tickets and participating in one of our resort preview one of the mornings that you are in Orlando. 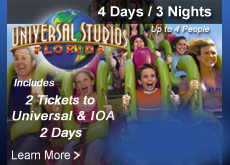 Visit www.orlandodiscount ticketsusa.com to discover vacation packages for your family and take the best entertainment of Orlando Florida. Animal Kingdom have set up the official openning dates for the openning of Pandora: Tha Land of Avatar a fabulous, out of this world land that will inmerse visitors on the very succesfull movie Avatar. With schedule dates Disney think on pretty much every detail to elevate expectations but also to acomplish their goals on making a dream come thrue. Orlando Disocunt Tickets USA just imagine how trascendental will be for the movie followers as it is for example for Toy Story productions, Star Wars and other that has prescence at the Disney Theme Parks. Orlando Discount Tickets USA is already seing and increment om the demand of vacation vacages that usually was low in general on the month of may until June 13th. This year 2017 demand for visitor to make their vacation packages a really is a fact with elevated demand of traveling since may 21, 2017. Orlando Discount Tickets USA know who it is the first days or even a year of an attraction that is new and suggest to the vsiitors not only start purchasing your vacation packages at Discounted price for Disney but also keeo this in mind when visiting Pandora: the Land of Avatar. Stay until late or very close to the closing time of the park to experience the Valley of Mo’ara in which Animal Kingdom will glow at night. Check if based on vacation package you are able to participate on the Extra Magic Hours from 11 p.m until 1 a.m to enjoy the rides mainly. Use Disney Fast Pass along with My Disney Experience App, keep in mind that at the beginning Disney Animal Kingdom will allow you to do fast pass reservation for only one of the main attractions of Pandora. Explore to get admission not for 1 day buy for 2 days to repeat your visit to Animal Kingdom. To visit 1 Day Disney startin on may 26 a during the whole summer will be $15 dollar extra so your admission might be for $132 per person. If you buy at leat 2 day admission so get some saving by paying $215. 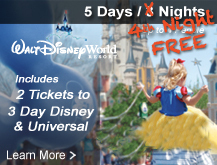 Explore the disocunted ticket promotion with Orlando Discount Tickets USA where you can purchase admission for 4 days in Disney with the Hopper Pass included. Explore your option visiting www.orlandodiscountticktesusa.com and star making your plans to visit Waltd Disney World. With high expectation and much probably generation high traffic of Tourist visiting Animal Kingdom Pandora: The Land of Avatar finally is expected to open on May 27, 2017 just in time for a great debut for Summer visitation. Orlando Disount Tickets USA share some of the most relevant news around about this Alien Wolrd that in a film has created one of the most higher ticket sales in the wolrd of cinematography. The preview on Pandora will start on May 2nd with Cast Members. On May 13 -22 some Annual Passholders will have the possibility to visit Pandora. The special evenning EMH(extra magic hours) will be available between May 27 and July 4 betweem 11:00pm and 1:00 am. For those intended to use of the three fast pass alloweb for Disney in one Theme Parks during the days of Opennings the Thee Parks will only le you select Flight of Passage or the Na’Vi River Journey. Pandora will have really creative and healthy products with wholesome grains, fresh vegetables and hearty proteins at The fast Casual Satu’li Canteen Restauntant. The Restaurant Salu’ti canteen at Pandora will be the first one offering Mobile Order through My Disney Experience. I fyou feel touch by Avatar the movie you are most likely to visit Disney Animal Kingdom and the best way to save on your vacation package or Discount Tickets is with orlando Discount Tickets USA, estar exploring our deal at http://www.orlandodiscountticketsusa.com.